Last year I was spontaneously moved to start the HHH Awards and chose the first recipient, Detta Buch myself. This year I am opening the arena and inviting others to submit nominations online, via this blog (see below for link to entry forms). One nomination per person. 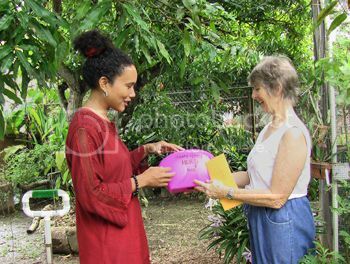 Internationally, there are many admirable people (both Trinis and foreigners), but please let your nominations be for citizens of T & T who are currently residing in T & T. International readers, whether Trinis or not, you are welcome to nominate someone in TT if you are aware of one you find worthy. 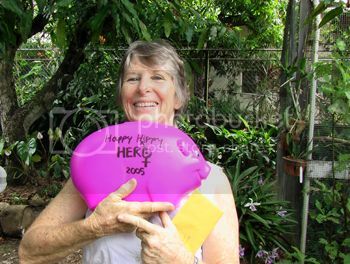 Flashback to November 2005: Detta Buch, first ever recipient of the Happy Hippy Hero's Award (2005) receives her cheque from Happy Hippy Productions and the trophy - a symbolic piggy bank which has accompanied her to many an event ever since. Over the past year, the pig has collected funds on behalf of W.O.R.C. 4. Someone who, against all odds, continues to believe in their cause and work tirelessly towards the realisation of dreams and goals connected to this cause (despite difficulty in acquiring funding/having to self-fund efforts and projects). All submissions will be accepted via e-mail. N.B. Due to technical difficulties with another host site, the actual form cannot presently be uploaded to the blog for your easy access. I apologise for this inconvenience but will let you know as soon as everything has been rectified. In the mean time, I will copy and paste the submission form and further details below for those who wish to submit nominations now. The esteemed judges will be announced shortly. Anyone, local or foreign, may submit a nomination online, once their nominee is valid and fits the below basic criteria. (ii) All forms will be e-mailed to the four judges. They will each select a SHORTLIST ... X amount of favourable entries ... with X to be determined based on number of submissions received. (iii) The judges will meet in person and vote on the chosen forms together. If they all agree on one, that person will be the Happy Hippy Hero. In the event that the judges’ opinions are divided, HHP will make the final decision. The judges have the right to deem which submissions are ‘serious’ and which are not. So please do not waste their time or yours by submitting false nominations. N.B. Upon selection, shortlisted nominees will be interviewed for confirmation of their status, eligibility, etc. As this is only the second year of the HHHA, there are still certain aspects to be refined. For example, provisions will be made for offline users to take part (if not this year, then certainly by next year). Any questions and suggestions for improvement are welcome.